On the face of it, it’s fair enough to assume that none of the signings have paid off. Record signing Cornelius returned to FC Copenhagen with his sole contribution being as collateral in the sackings of manager Malky Mackay and Head of Recruitment Iain Moody. Despite being bought for comparatively meagre sums of money, Aston Villa’s Danish signings have had a nightmare start to English football. Helenius’ only telling contribution thus far has been as a viral hit after his shorts fell down whilst shooting against Tottenham, and his team mate Okore, who had made a promising start to his Aston Villa career, has been sidelined since suffering a season-ending knee injury back in September. The transfer of Cardiff’s 20 year-old Danish striker Andreas Cornelius back to FC Copenhagen may not have caused Jim White to bounce off the walls in his apparently coke-free enthusiasm for all things on DEADLINE DAY, but the whole debacle provided further evidence of the ridiculous nature of transfers in the Premier League. As football fans were gripped with the hugely exciting ‘will-he-won’t-he’ saga of Lee Cattermole’s proposed move to Stoke (surely the most depressing transfer speculation in recent years), the Welsh club’s previous record signing returned home to Scandinavia without so much as a sideways glance. The cold-hard fact for much-maligned Cardiff owner Vincent Tan is that his side essentially loaned Cornelius for 6 months to the tune of £5 million in what can only be viewed as a robbery suitable for ‘Nordic Noir’ favourites The Killing and The Bridge. Here was a talented but largely untested forward who somehow accrued a pay rise from £6,000 to £45,000 a week. Someone give his agent a medal. Yet for all the off-field issues, the ‘flop’ tag bestowed on the giant Dane is surely premature. Being unfavourably likened to a Toyota rather than the desired Bentley by Tan hardly helped matters. Yes, the oft-quoted statistic of 0 goals and 0 starts is brutal reading and makes for perfect sports tabloid fodder, but the kid barely had a chance. An ankle injury suffered in pre-season disrupted his integration into English football, and can help explain why he appeared laboured and sluggish in many of his late substitute appearances. Malky Mackay pointed out before his sacking that Cornelius was “one for the future” – a player who would come into prominence in the second half of the season, and there is undoubtedly truth to this statement. After bursting onto the scene for FCK at the back end of the 2011/2012 season, the young striker excelled the next year after the departure of fan favourite Dame N’Doye – bagging himself 18 goals in 32 league games and bringing the title back to Parken. His meteoric rise has seen him capped seven times by the Danish national team, and popular opinion in Denmark marks him out as the ideal candidate to replace the laughing stock that is Nicklas Bendtner, who spends more time on the front pages of Danish tabloids and stumbling out of trendy Copenhagen clubs than he does on the football pitch. It seemed probable that Cornelius’ Cardiff career would kick-start under the management of Ole Gunnar Solskjaer, who was a known admirer of the Dane from his time at Molde, but evidently his association with the failings of the Mackay management was to be to his detriment. A return to Denmark has been welcomed by the player himself, who needs plenty of playing time at this early stage of his career, and FCK’s title charge will of course be greatly strengthened by the return of their favourite son. A tall, powerful and clever striker with a big future ahead of him – Cardiff’s loss is very much FCK’s gain. Aston Villa’s Scandinavian contingent have not had a much easier time of it, but the second half of the season holds some promise. Beanpole striker Helenius, despite playing only a handful of games, bagged his first goal for the club in the shock defeat to Sheffield United in the FA Cup, and will hope to fill the boots of injured striker Libor Kozak throughout the rest of the campaign. 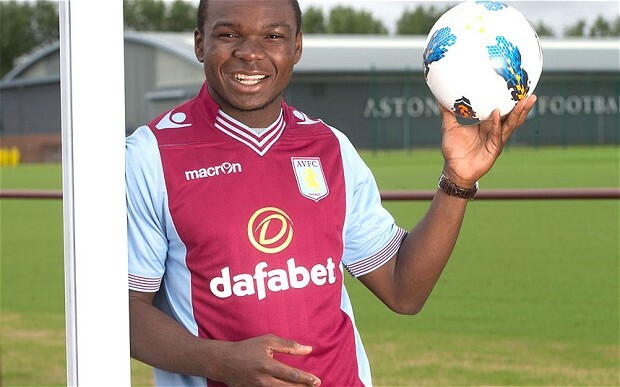 Colossal defender Jores Okore is perhaps best-suited to thrive in the Premier League, and his anticipated return from anterior-cruciate ligament damage next month will be a huge boost to Paul Lambert in light of persistent injuries to Ron Vlaar, Ciaran Clark and Nathan Baker. Modelling his game on the great Marcel Desailly, Okore is blessed with surprising pace and passing ability for a man of his build, and is dominant in the air despite not being the tallest of defenders at 6 foot. Villa pulled off a major coup in luring the Danish international to the Midlands, as he was reported to have rejected Chelsea in January 2012 after a series of eye-catching displays for FC Nordsjaelland in the Champions League, and was also personally recommend to Sir Alex Ferguson by Danish hero Peter Schmeichel. If he fully recovers from his injury, Aston Villa will have a brilliant prospect on their books. Unfortunately, with Cornelius’ time in Britain coming to a premature end and Aston Villa’s Danish contingent struggling to have an impact this season, it may be the case that Premier League clubs will be reluctant to go shopping in the Superliga during the Summer. Much like the Eredivisie, the gulf in quality is marked and purchases are therefore always a gamble, but clubs will do well to note the impact Daniel Agger, Bryan Oviedo and Winston Reid have had on these shores in the last decade. This entry was posted in Analysis and opinion and tagged Andreas Cornelius, aston villa, cardiff city, Danish Superliga, denmark, jores okore, malky mackay, nicklas bendtner, Nicklas Helenius, premier league, vincent tan by Josh Dishman. Bookmark the permalink.